Martyn Croston is a jazz pianist and piano teacher based in south east London. He has performed throughout the UK, Canada, Russia, Spain and the US, both as a solo pianist and with numerous ensembles. 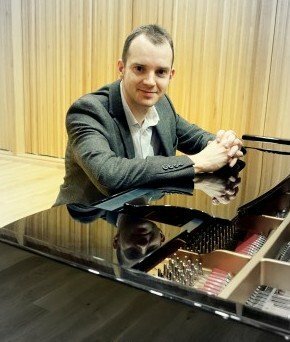 After Martyn completed his BA in Music at the University of Bristol, he moved to Moscow to teach English and study jazz piano. During his time there, he played regularly with MondayFunk, a Russian funk group who performed at a number of venues in the city, including the prestigious B2 Club. Martyn also featured as a guest pianist at a concert with the Ukrainian guitarist Roman Miroshnichenko. In 2007, he received a scholarship to study a Masters at Western Michigan University, where he received lessons from Dr Stephen Zegree and Tad Weed. Martyn was the pianist for the vocal jazz group Gold Company and performed at the International Association for Jazz Education in Toronto with Darmon Meader from New York Voices. He also played in a jazz quartet that supported the African American Jazz Caucus featuring the jazz educator and saxophonist Jamie Aebersold. Martyn performed at two annual shows with Gold Company, supporting The Velvelettes (from Motown) and the winning choir from NBC’s Clash of the Choirs. Through the university, he also played at two jazz clinics with the jazz vibist Stefon Harris at schools in the Kalamazoo area.